Dr. Yarinsky is the only Capital District office to provide you with Altair Instrument’s new DiamondTome™ DT2 skin resurfacing system with HydroPlus+ Serum Infusion. The DT2 provides “fitness” for your body’s largest organ: your skin. This is the “workout” your skin needs. Your skin care specialist’s choice of several HydroPlus+ serum infusions provides a personalized skin nutrition plan. DT2 is a customized 30-minute solution to your skin concerns using new state-of-the-art microdermabrasion that eliminates the need for messy crystals. Small diamonds located at the tip of the wand sweep away the dead skin surface layer and imperfections, while HydroPlus+ Serum infusion kicks the “Hydrafacial MD” and “Oxygen Facial” results up a notch by using advanced medical/hospital-grade technology. DiamondTome™ with HydroPlus+ treatments are a revolutionary solution for age-defying skin, your “Bright Star to Beautiful Skin”. DT2 is a non-surgical, non-invasive skin resurfacing procedure offered at our Medical Spa that works with your body’s system of skin growth and replacement. Fine particles of diamond chips located on the tip of the wand gently exfoliate or remove the dead outer layer of old skin cells. Suction is used to vacuum them away in a clean and controlled manner. This process accelerates your own skin cell turn over, revealing the younger looking, tighter, healthier new skin underneath. Fine wrinkle lines, environmental damage, skin imperfections, keratosis, discolorations and hyperpigmentation are treated. All skin types can be treated depending on what size diamond chips are used. Imperfections are removed; new collagen growth is promoted; and you receive improved skin radiance, tone and smoother texture. A signature HydroPlus+ Serum is chosen to complement your skin type to infuse into your skin using the new Hydro Wand®. This hydrates your skin and improves skin texture and appearance. The patented Hydro Wand® infusion system allows for deeper product penetration, hydration and nourishment all in one treatment. The HydroSerums™ are available in several types: Acne, Deep Hydration, Even Tone, and Vitamin C. Each HydroSerum is formulated with highly effective active ingredients for maximum performance. Think of our specially trained and experienced aesthetician as your skin’s “personal trainer” who will provide you with recommendations for the ideal serum for your skin and the optimum number of treatments needed to obtain the best possible results. Commonly treated skin conditions – While the following list is not meant to be all-inclusive, you’ll realize that just about all skin types and skin problems benefit from DT2 treatments to improve overall skin health tone and texture. Treatments can benefit all skin colors and all skin types. Areas that may be treated with DT2 – While our skin care specialists concentrate on improving your face, your neck, Décolleté (upper chest “V” area located between and above your breasts), hands and arms, back and virtually any area exhibiting “problem skin” may be successfully treated. Why DT2 is better than other microdermabrasion/infusion systems – DT2 uses innovative multiple skin levels micro-resurfacing with sterilized micro-diamond chip wand tips and proprietary Hydro Plus+ serum skin infusions for more effective exfoliation and accelerated results. 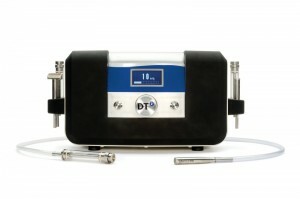 DT2 is the next generation in microdermabrasion. How you will look after the DT2 treatment – Your skin may look slightly red or flushed immediately after the 30-minute treatment due to increased circulation, but color returns to normal within another 30 minutes. Your skin should look and feel smoother even after the first treatment. There is typically no pain or discomfort before or after your treatment and no down time. You can immediately return to work and to your regular activities. When you will see results with DT2 treatments – While you will likely notice visible results after your first treatment, lasting and more significant results will occur after six to eight treatments spaced about two weeks apart with maintenance treatments recommended every two to three months thereafter. The initial series of six to eight treatments gets your skin up to a “plateau.” The maintenance treatments take over from there to provide you with long-term skin fitness. Skin care recommendations after DT2 treatment – Since exfoliated skin is more sun sensitive, a good SPF 30 or greater sunblock is recommended for protection. We recommend several in-house brands such as EltaMD® and several over-the-counter brands as well, if you prefer. Avoid unprotected tanning of the treated area(s). It is very important to continue to provide essential nutrients and protection to your newly exposed and healthier skin. Speak with our skin care specialist for recommendations for medical-grade home skin care products to maintain and boost the positive effects of your office treatments. If you would like more information, please contact us to schedule a consultation with Dr. Steven Yarinsky and his skin care specialists at Saratoga Springs Plastic Surgery’s medical spa near Albany.